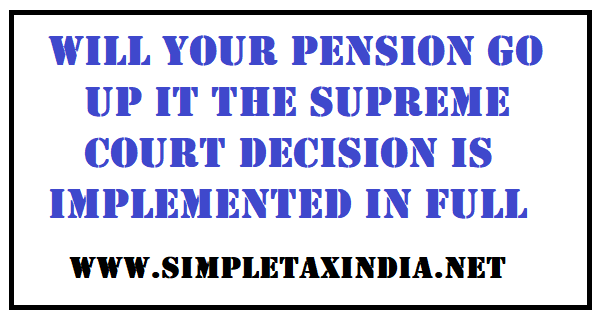 The Supreme Court has on 1st Apri 2019 has rejected the Special leave petition filed by EFPO against the decision of Kerala High court on quantum of pension payable to an employee after his retirement under under employee pension scheme(EPS) 1995. This decision has generated wide spread interest in people working in organised Sector as well as those who have already retired. Let us understand the implications of the decision. The Employee Pension Scheme in 1995 provides for pension to pension to employees of private sector, their widows and nominees. This scheme operates under the provisions of Provident Fund Act, 1952. Under the Scheme 12% Provident Fund (PF) contribution made by the employer, 8.33% is transferred to EPS account of employee. As per the scheme the amount to be transferred for pension account was capped at 6500 which was increased to Rs. 15,000/- later on. So though your PF contribution might have been made at higher basic salary, the amount transferred to the pension account was restricted with reference to Rs. 15,000/- only and the balance 3.67% of 15,000 and 12% over the pensionable salary of Rs. 15000/- remains in the PF of the employee. The employee gets pension after completing 58 years of age. An employee becomes entitled to pension only if he has rendered completed services for 10 years. In case the completed service is less than 10 years he can withdraw the balance in his EPS account. For computing pension maximum of 35 years of service are considered even if the actual years of services are higher. The employee is entitled to a minimum of Rs. 1,000/- and maximum of 7,500/- as pension under EPS. Amount of pension payable= (number of completed years of services+2)*(15,000 or the average pensionable salary if it is less than 15,000/-)/70. The bonus of 2 years is added if the completed years of service exceeds 20 years. Any period over six months is taken as one full year and lower period is ignored. The average salary is computed with reference to salary drawn during previous five years earlier this period was 12 months. The Supreme Court decision has opened Pandora Box. The decision if implemented, as it is, will substantially increase the pension of all the present employees on retirement, ex-employees, their widow and nominees. Is it possible for the EFPO to service such enhanced pensions for such a large number of people? I do not think EFPO can take this much load unless the government comes to its rescue. As per a newspaper report if the enhanced pension is given, the entire corpus of EPS will get exhausted within 4 years time, leaving pension of employees still working in jeopardy. This will also pose problem of payment of arrears of pensions in respect of the employees who have already retired. In order to ensure that the pension of employees still working, the differential amount of contribution of EPS may be made from their PF account but what about recovery from the people who have already retired and have withdrawn their entire balance in PF account. In case of employees who have changed jobs during the career, some of the employers would have contributed on the entire salary on which PF is contributed whereas some of the employers would have contributed only on the basis of the minimum amount of Rs. 15,000/-. In such a situation an employee who retires with higher contribution will be beneficially placed against a person whose contribution based on Rs. 15,000/- at the time of his retirement. As the Kerala high court has restored the basis of 12 months salary for computation of salary, it will also become open to manipulation as well. The pensionable salary may see substantial increase in the last year of the employment so as to entitle the employee who is superannuating soon, for higher pension. There are many such tricky situations which will arise and which it is not possible to envisage all now. The government may also carry out amendment in the EPF act to negate the decision of Kerala High Court. I will keep my fingers cross on how the decision will work and be implemented.